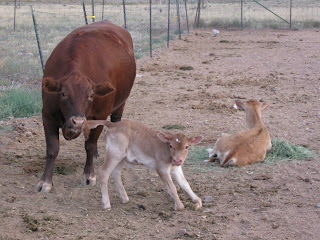 Our mix breed beef heifer was bred by our mini Jersey bull before he found a new home on a ranch breeding heifers for first calf size desires. Anyway, after 24 hours she still could not stand on her front two hooves. Come to find out the tendons were contracted and restricting the ability for her to extend her hooves and put weight on them. I called our livestock vet (he’s another hero in my life) and talked to him about the issues. He explained that he’d seen this before and had an easy fix if dealt with right away. He advised us to take a magazine and tube it up as a splint, then use vet wrap to secure it to the front legs. Then, on his way home from another call, he stopped by and gave our new little girl an injection of Oxtetracycline, explaining that too much calcium in momma’s system created a build up of calcium on the tendon. The Oxtetracycline binds to the calcium attached onto the tendon and allows it to stretch out and become flexible again. Typically, it should only take the one inj ection to pull the excess calcium away from the tendons. If in three days her legs aren’t completely straight and she’s not standing on her hooves properly, then a second injection may be needed. The splints force her to put the weight on her hooves instead of her first joint. She got her injection last night and we used a Cabella’s magazine cut in half as splints, then vet wrapped them around her legs from just above the first joint down to the bottom of her hooves. 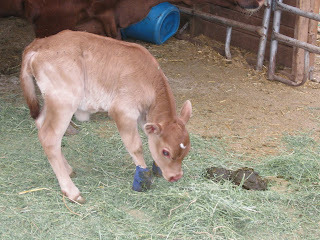 So far, she’s putting weight on her hooves and with any luck will have the splints off tomorrow or the next day. I did some reading and found out that this can also happen to foals, kids, and many other live stock varities. All seem to respond to the same treatment. The dosage of antibiotic varies on the breed and size of livestock so please consult your vet before guessing and injecting too much. A too large of injection can cause the heart to stop which is a sad outcome for all involved! Best of luck to all of you homesteaders and wish us luck on our new baby girl! 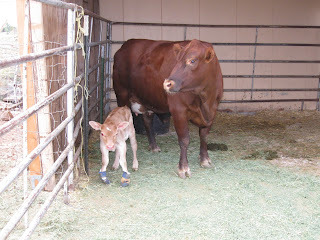 This entry was posted in Cattle, Homesteading, Livestock Medical on September 2, 2009 by Homesteader's Supply.